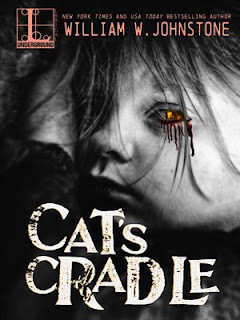 Cat's Cradle by William W. Johnstone has been around since the 1980s and is one of an increasing number of books from that era being made available in digital format. This was an enjoyable read and typical of the books I loved as a teenager. It had literally everything - monsters, flesh-eating bugs, zombies and even the Lord of Darkness himself, Satan. What more could a horror fan ask for? It's certainly not one to be taken seriously and had me laughing out loud at times; especially when Satan uses the telephone to make a phone call. I mean, come on, a phone, really??!!! This book was a fun way to spend a few hours on a rainy day and I'm happy to have had the experience. No one knew where she had come from. A scrap of a girl clinging to a black cat with eerie yellow eyes. A lost child or an orphan, maybe. It was a miracle she had survived on Eden Mountain at all. Suddenly strange things began to happen in placid Ruger County, bizarre killings that the police couldn’t solve. Horrifying accidents that the people couldn’t comprehend. An insatiable beast was stalking their intimate hideaways, their swimming holes—and their children. No one noticed how quickly the little girl’s pale cheeks turned pink with health. How her frail body filled out with sleek, lithe muscles and feline grace. And no one noticed that at night her innocent blue eyes turned an eerie, evil yellow . . .